Wealthy individuals and their heirs win big. The hottest class-warfare debate around the tax overhaul legislation involves the inheritance tax on multimillion-dollar estates. Democrats wave the legislation’s targeting of the tax as a red flag in the face of Republicans, as proof that they’re out to benefit wealthy donors. The House bill initially doubles the limits — to $11 million for individuals and $22 million for couples — on how much money in the estate can be exempted from the inheritance tax, then repeals it entirely after 2023. The Senate version also doubles the limits but doesn’t repeal the tax. Corporations win all around, with a tax rate slashed from 35 percent to 20 percent in both bills — though they’d have to wait a year for it under the Senate measure. Trump and the administration view it as an untouchable centerpiece of the legislation. U.S. oil companies with foreign operations would pay reduced taxes under the Senate bill on their income from sales of oil and natural gas abroad. Beer, wine and liquor producers would reap tax reductions under the Senate measure. Companies that provide management services like maintenance for aircraft get an updated win. The Senate bill clarifies that under current law, the management companies would be exempt from paying taxes on payments they receive from owners of private jets as well as from commercial airlines. That was a request from Ohio Sens. Rob Portman, a Republican, and Sherrod Brown, a Democrat, whose state is home to NetJets, a big aircraft management company. An estimated 13 million Americans could lose health insurance coverage under the Senate bill, which would repeal the “Obamacare” requirement that everyone in the U.S. have health insurance. The projection comes from the nonpartisan Congressional Budget Office. Eliminating the fines is expected to mean fewer people would obtain federally subsidized health policies. People living in high-tax states would be hit by repeal of federal deductions for state and local taxes under the Senate bill, and partial repeal under the House measure. That result of a compromise allows the deduction for up to $10,000 in property taxes. Many families making less than $30,000 a year would face tax increases starting in 2021 under the Senate bill, according to Congress’ nonpartisan Joint Committee on Taxation. By 2027, families earning less than $75,000 would see their tax bills rise while those making more would enjoy reductions, the analysts find. The individual income-tax reductions in the Senate bill would end in 2026. 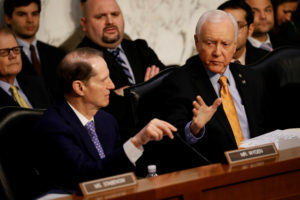 Left: Sen. Orrin Hatch (R-UT) speaks with Sen. Ron Wyden (D-OR) during a markup on the "Tax Cuts and Jobs Act" on Capitol Hill in Washington, D.C. Photo by REUTERS/Aaron P. Bernstein.